Mango is a delicious and refreshing tropical summertime treat, and mango butter is an especially great way to treat your hair and skin! As the name implies, mango butter comes from mangos, but not the fruit. Mango is derived from the fruit kernel, the giant seed inside of the mango. Mango butter is soft and pliable characterized by its high content of stearic acid, giving it physical properties comparable with cocoa butter. It is highly emollient and has good spreadability and excellent stability making it fairly easy to use in hair and skincare formulations. Mango Butter can do wonders for problem skin. Adding a little to your facial moisturizer or serum can help problem skin look and feel better quickly. Mango butter also works excellently to bring softness to curly hair and dry hair. I have rather coarse hair that has a little wave and a lot of frizz and I love to use a little mango butter, virgin coconut oil, and fresh banana for a fun summertime hair masque. It leaves my hair soft and shiny and seems to reduce the frizziness. 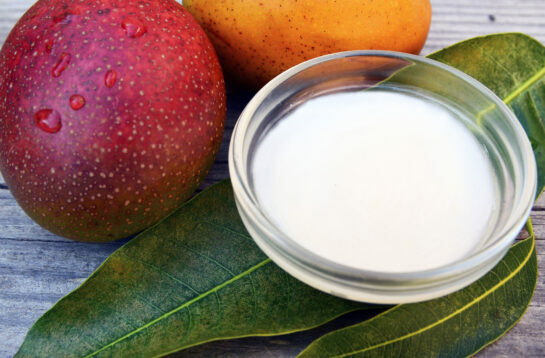 Mango butter can also be used to thicken oils for a luxurious facial serum. Check out the recipe below for Strawberry Mango Facial Serum. I personally use this serum once to twice a week! The fatty acid composition of mango butter is why it is such a great emollient. The main constituents are Stearic acid and Oleic acid making up about 95% of the fatty acid profile. Stearic acid helps to bind water and oil. Because of the high percentage of stearic acid in mango butter, it keeps moisture on the skin and gives. Stearic acid also gives the butter it’s luxurious skin feeling, it helps with glide and that feeling of smoothness. Oleic acid is what you want if you have especially dry skin or hair. The high percentage of both of these fatty acids in mango butter make it a perfect ingredient for both dry and dehydrated skin and hair. This simple 4 ingredient serum is the perfect solution for those who want a simple, effective serum for day or nighttime use. The Organic Mango Butter leaves skin soft and nourished and Strawberry Oil absorbs quickly and imparts a delicate strawberry scent that is simply divine. Strawberry seed oil is sometimes hard to find, so you can always substitute with another oil, I think Daikon Radish Seed is the best substitution. While this easy recipe has only 4 ingredients, it’s and easy to make and feels luxurious on the skin leaving a satin finish whether you use Strawberry Seed Oil or Daikon Radish Seed Oil. 1. Gently heat Mango butter, Jojoba Oil and Vitamin E until fully liquid melted, be careful not to overheat. Mango butter will melt at approximately 100F. 2. Remove from heat and add Strawberry Seed Oil. 4. While still hot, pour off into packaging and place in refrigerator or cool room. Rapid cooling will help prevent the mango butter from crystallizing. 5. Use on cleansed, toned skin day or night for a moisturized, beautiful complexion. Check out our YouTube Channel for detailed instructions on how to make this serum. Cosmetic Formulator/ Kitchen Chemistry Host Teeneke holds a diploma in Organic Skincare Formulation from Formula Botanica and also hosts Essential’s Kitchen Chemistry channel on YouTube. In 1996 she purchased her first Encylopedia of Medicinal Plants which inspired her enduring and profound love for the amazing medicinal properties of plants. She began by harvesting plants she could identify in the Pacific Northwest and made her own extracts and tinctures. She joined Essential in 2012 and continues to pursue her passion.